From bed linen to wall art, we try our best to create a space for our children to call their own. What better way to do this then by adding a creative and colourful touch to your little dreamer’s room. Handmade and hand painted items are a rare find and add a unique feel to a room. The work of a Sydney-based artist, Nod headboards are made up of individual wood tiles that stick directly to the wall, which means less clutter in your kids’ room. 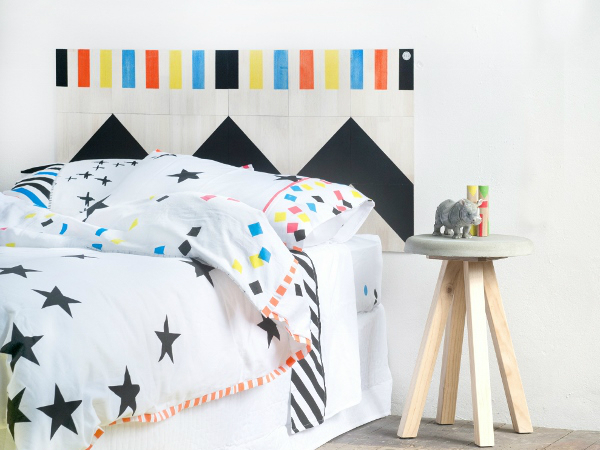 Nod headboards for kids are available in single size for $179 or king single for $189. Adult designs are also an option. Having not just a passion for art but also for the environment, Nod uses eco friendly wood tiles for their headboards and even go so far as wrapping them in eco friendly packaging, so it’s a guilt free purchase. There is a choice of two designs, both of which use vibrant colours that are sure to brighten up the room. The ‘Morning Sunshine’ design carries neutral tones with a burst of multi-coloured trim, featuring a large spot of colour bringing to mind a rising sun. The ‘Circus’ design stars a large black zig zag, finishing with a trim of block colours above. If you’re looking to splash a bit of colour and fun into your little one’s room, then Nod’s handmade Kip headboards are the perfect thing. Buy them online direct from Nod.